This Neodymium magnetic sheet is designed to provide the strongest grip possible on magnetic metal based surfaces. The magnetic tape is self-adhesive and pliable, ideal for a diverse range of applications. Because our self-adhesive, flexible magnetic sheets are easily cut to size with scissors it makes their creative uses endless. Whether you are a craft enthusiast, want to create your own signs or want to make your artwork or photos magnetic you will find our magnetic sheets really useful. Because they are much less powerful than 'hard' Neodymium magnets they are much easier to handle and work with. These Self Adhesive Flexible Neodymium Magnetic Sheet are designed for attaching favourite artworks, photographs and sporting memorabilia and the like to walls and other vertical surfaces often improves the amenity of a room. Whether in the workplace, home or school or hospital, these decorative items can give ongoing comfort and inspiration to people who occupy these spaces. Neodymium Flexible Magnetic Sheets can provide mighty holding force for many of these tasks, and offers significant advantages over more common fixing methods. Magnetic strips or self-adhesive magnetic sheets adhere to different surfaces with the aid of a metal plate affixed to the back of items, without breaching or penetrating the walls painted surface. This capability of magnets over nails, screws and some other adhesives makes it easier to move the items to a different position on the wall reducing the need to repair the damage created by a penetrative fixing. Repairs needed to fix screws, nails or hooks can require the entire wall be repainted thanks to the difficulty of matching paint colours. Our Neodymium Flexible Magnetic Sheets are easily cut to size with scissors it makes their creative uses endless. These sheets are made from the strongest flexible magnetic material on the market and are ten times stronger than our standard flexible products. 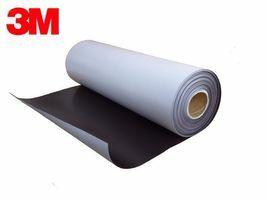 Who supplies high quality 3M Self Adhesive Neodym Magnetic Sheet? Magnosphere offers best priced 3M Self Adhesive Neodym Magnetic Sheet globally to all industries, including Automotive, Aerospace, Military, Advertising, Design House, Electronic and Academic/R&D. Please inquire for custom Neodymium magnets or magnetic assembly. Buy 3M Self Adhesive Neodym Magnetic Sheet at Magnosphere and get a better deal!